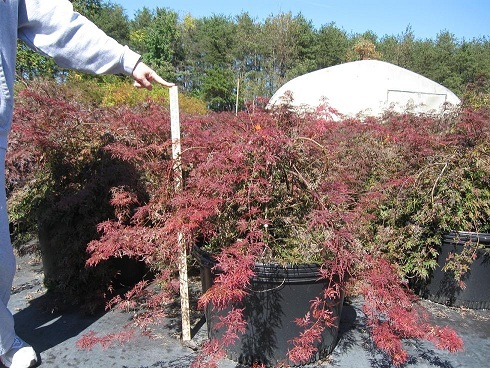 You have made a great choice in your search to buy Japanese Maple Trees, please give us a try! Memorial Maples	We offer a nice 2 year old Japanese Maple as a Memorial Planting in Honor of a Person or Pet lost. Mega Size Red Laceleaf Japanese Maple	While the super large maples are dormant, we can remove some soil and ship Fedex, CLICK HERE FOR MORE INFO! 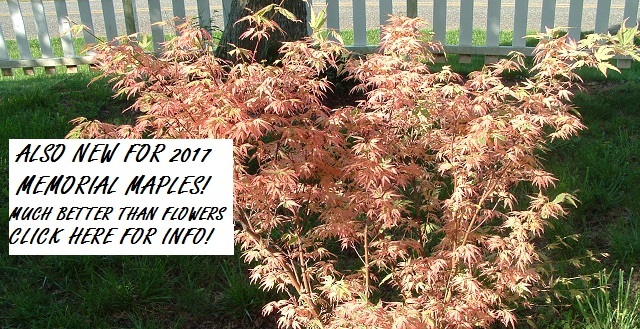 Red Japanese Maple Seeding Sale - From $6! A great deal on Red Seedlings for Planting or Grafting! CLICK HERE FOR MORE INFO! JAPANESE MAPLES ARE A GREAT WAY TO ADD SOME VARIETY YOU YOUR LANDSCAPE! JAPANESE MAPLES ARE 99% OF WHAT WE GROW AND SELL! Welcome to JapaneseMaple.net. We have been growing Japanese Maples for over 25 years. We are located in the foothills of the Appalachian Mountains, in North Carolina. This is an excellent region to grow the small maples, and get them ready for your landscape. 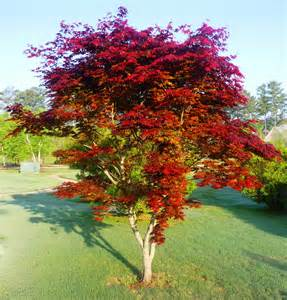 We have over 100 varieties of Grafted Japanese Maples, as well as, value priced Red Japanese Maple Seedings for sale. We have 25 years of experience in shipping the maples so you can be assured that we will ship your maple in great condition and guarantee that they arrive in great shape. You have come to the right place to buy your japanese maples online. Our shopping cart is very easy and safe to use. You can easily find a page of all of our japanese maples or, the lace leaf varieties, broadleaf varieties, variegated varieties, the dwarf maples, and the bamboo leaf maples. We specialize in Rare and Hard to find Japanese Maple Trees. There are several hundred varieties of Acer Palmatums (Japanese maples), with upright growers, lace leaf varieties that canopy, and many that are great for bonsai. We do much of the grafting, and all the growing, right here on our small nursery. Japanese maples are very easy to care for and last for hundreds of years! 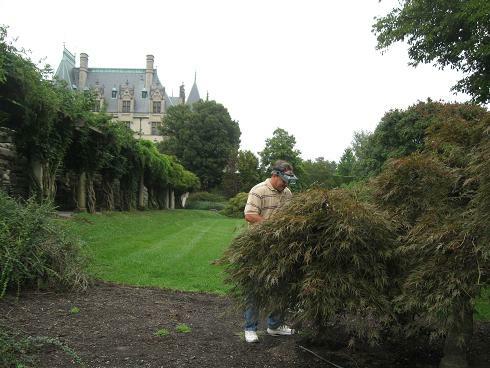 We are the only nursery allowed to graft the Legendary Japanese Maples on the famous Biltmore Estate. The grounds of the estate were designed by Frederick Olmsted, the founder of American Landscape Architecture. A Maple of the Month Club! Check it out for a great 5 tree deal! Also new are Memorial Maples with sympathy card, in honor of a loved one or pet. BRAND NEW FOR 2019, CLICK HERE FOR OUR JAPANESE MAPLE SPECIAL PAGE! We ship grafted Japanese maples, seedlings, bare root plants and other trees up to 4 feet tall anywhere in the USA. We specialize in Japanese maples and recently expanded into many woody ornamental plants and vines, including Leyland cypress trees for a nice privacy border. We graft and sell the acer palmatum right here from our family farm. Buy direct from the grower, acer palmatum's (japanese maples) last for hundreds of years, so you can also help the environment.We have recently closed our Christmas tree farm, in order to spend more time on the nursery. We are in the process of adding a new shade house, and more room to expand our varieties. We normally carry at least 100 varieties, and hope to have more in the future. The maples are very easy to grow and are not very picky. They just like well drainging soil, and a little spring fertilizer. The lace leaf maples are the most popular, and we specialize in these lace leaf varieties. Fall color is one of the greatest characteristics of Japanese Maples. Please contact me with any questions at jherter@twave.net. Please click on our "Japanese Maple" button above to see all the maples and other plants we have to offer. We also have organized the maples by growing habits and other characteristics, to help you with your selection! HAPPY SHOPPING, AND THANKS FOR LOOKING! The japanese maple has been around since the early 17th century, and have been bred, selected and propagated since that time. The japanese people have had the most influence in the development of these maples. within the last 100 years the japanese maple has been developed even more in the united states. many new maples have been cultivated to fit the growing needs and climate of most all of the us. There are now several hundred varieties, that have different shapes, growth habits, leaf color, leaf shape, and hardiness. The maples form very small flowers in the spring, that quickly transform into the maples seeds. The two distinct growing habits that the buyer needs to decide on, is an upright grower vs. a canopy grower. The upright growers grow taller and more "upright", they provide a little more shade, and a higher canopy. in general tey can reach a height of 15 -20 ft. in general, these maples have a broader leaf. The canopy type growers and the most popular and unusual of the japanese maples. most of is variety also has the deeply divided leaves. these grow on average about 9-10 ft tall, and many varieties stay much smaller. Leaf colors are by far the most striking characteristic of japanese maples. the leaves vary in color with each season, and can even have variegated leaves, with multiple colors on each leaf. fall color is when the maples really slow off, and provide a bold canopy to your landscape before cold weather. Japanese maples are great for your landscape and also for containers. they grow slowly and can stay in the same container for many years. many customers love to collect different varieties and have a japanese garden. it is a very good way to have a landscape that is different then the neighbors! Bonsai collectors are also very high on japanese maples. there are many dwarf varieties that are perfect for this highly skilled art. for the patient bonsai pruner, these maples are top on their list. To summarize, i would just say that anyone wanting something different for their landscape, garden, or patio, you can not go wrong with one of these beauties. please visit my current inventory, which i have tried to separate by characteristics. If you have any questions at all, please email me at jherter@twave.net. we will answer you asap. My wife and i do most of the grafting, and all of the growing, shipping, and customer service, but we try to answer questions within a day. thank you so much for your interest in our small nursery and for giving japanese maples a try. I think you will enjoy watching one grow and mature in your life!